Prime Minister Narendra Modi had announced his dream to link even the remotest areas with internet connectivity, under Digital India program. Under this project, the central government had recently launched a new scheme. 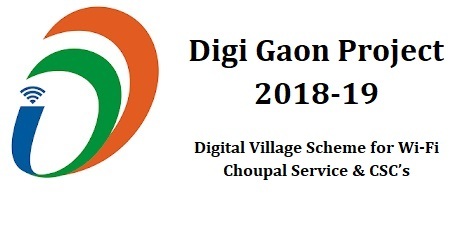 The name of this scheme is Digital Village or Digi Gaon scheme for Wi-Fi connectivity. As per this project, the government aims to provide internet connectivity in village choupals, which will develop the overall village. Initiation and development of internet in rural areas – With the implementation of this Wi-Fi connectivity scheme, people will be able to get digital facilities. Easy access to internet will bring about a boom in the village economy. Estimated villages to be catered – The central government desire to spread it over 700 new villages by the end of this year. Each village choupal will have an internet access center. Establishment of CSCs – As of now, this facility is available in 2.5 lakh rural panchayats. Sanitary napkin units – As of now, the central authority has succeeded in establishing sanitary napkin making units in 110 rural areas, By the end of 2018, the number is estimated to reach 6000. Affordable internet access – The choupals will offer internet access to people at very low cost. This will allow candidates to attain information and open their businesses. They may start cottage or handicraft industry at small scale. Candle making, sanitary napkins, health services are some common options. CSC for development of education – Digital India Initiative highlights the importance of Common Service Centers. Due to easy and inexpensive access to internet, all candidates who are interested in education will be able to apply for IGNOU and NIOS education system. As of now, there are 2.91 lakh CSCs, which are active in several parts of the nation. Enhancing village economy – With these internet access points, the economy of the area will grow. Community participation will increase, thereby enhancing opportunities for entrepreneurship and livelihood. Facilities at the CSCs – All the centers will have solar lights, installed in them for adequate illumination. Anganwadi and Asha workers will also be present at these centers. LED bulb units and sanitary napkin units will be present at these CSCs. Other areas of implementation – Though the scheme has been implemented in Jewar in UP, it will also be implemented in other areas such as Sultanpur and Dhanauri Kalan in the same state, Dayalpu and Piyala in Haryana, and Shivbabudih and Chandankiyari East in Jharkhand. Internet accessibility is necessary for the overall development of the nation and its people. For this, the central government is diligently designing and implementing new schemes, which are associated with the development and spread of internet to remote parts of the nation.